If your cat coughs or vomits after taking a pill, there's probably a good reason. 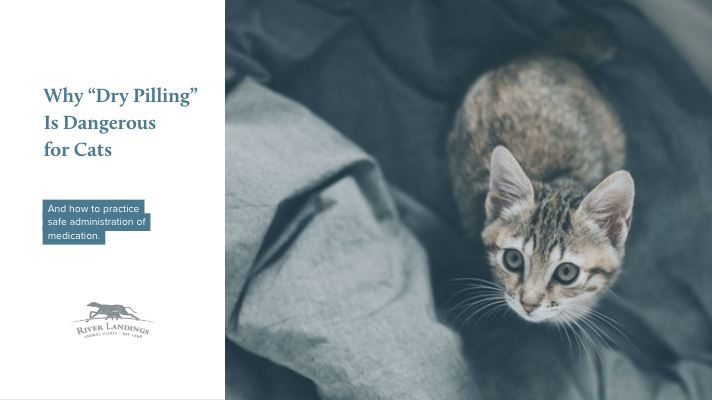 Coughing or vomiting after having swallowed pills dry could very well be a result of dry pilling (giving your cat a pill without any liquid). If you have ever tried to dry-swallow an aspirin, you'll recognize how uncomfortable the experience can be. Swallowing half a pill can even be worse, because of the sharp corners. Dry pilling can lead to pills getting stuck in your cat's esophagus (the tube leading from the mouth to the stomach). While dry pills are likely to get stuck, capsules are even more dangerous for cats. The smooth, gelatinous surface tends to cause capsules to lodge in the esophagus. A 2001 study presented in a veterinary journal stated that "After 5 minutes, 84% of capsules and 64% of tablets are still sitting in the esophagus." The study also brought out the dangerous occurrences of esophagitis, which can be caused by the irritation of pills and capsules remaining in the esophagus for long periods of time. This can often lead to blockage, entirely. Use a small 1cc syringe filled with either plain water or low-salt broth. Approach the cat from the back or side, rather than front-on. Keep the cat's head level rather than tipped back, to facilitate swallowing. Pill Pockets are cone-shaped, soft treats with a hole down the center. Just pop the pill inside and pinch the top closed, and offer it to your cat as a treat. Offering a favorite treat will not only encourage future pilling cooperation but will help get the pill into the stomach quickly so it can go to work. Try giving only a small portion of a regular meal of canned food before the pilling, and withhold the remaining portion for afterward. Some pharmacies will compound medications into flavored liquid doses, which are both easier to swallow, and a lot tastier than pills. Your veterinarian may work with a compounding pharmacy, a "regular" pharmacy may have flavors for pets (we strongly advise against shopping online for your pets meds). Some medications can be formulated into a gel or ointment that can be rubbed into your cat's inner ear. These can also be compounded by pharmacies. At least one of these solutions should relieve both you and your cat of the anxiety and discomfort found in dry pilling. Speak with your veterinarian specifically about the best approach for your feline friend. Parties mean doors getting opened a lot. Even if you have thoughtfully hung a sign on your bedroom door saying ‘Do Not Open’, or if you have your pets safely contained in a crate inside the bedroom, accidents happen. Make sure your pet ID tags and microchip information has your current address and phone numbers. Many pets have a favorite hiding place they go to when frightened. For some pets, a crate can lend a feeling of safety, security, and act as a sort of sanctuary. However, for some pets that did not grow up using a crate, it may only cause more stress and lead to injuries of their nails or teeth trying to get out. If crating is not an option, place your pet in a room they cannot hurt themselves or damage any belongings. For dogs and even cats, giving them plenty of exercise on New Years Eve day will help them achieve a more restful sleep that night. A good long walk or hike with your pup will help burn off any day-of anxiety for both you and your dog. Make sure everyone is on the same page that the dog is not allowed table scraps. The #1 reason pet owners end up at the emergency vet on New Year’s Eve or New Year’s Day is due to a sick pet from too much people food, good or bad. Even supposed ‘safe’ foods you think of can lead to pancreatitis, which can be fatal. Fireworks and loud music can disturb and upset even the calmest of pets. Put on white noise or classical music at a volume that will cover up outside noise. For sound-sensitive animals, many pets find relief in using a Thundershirt pet wrap (available at most pet stores). Food puzzles and new toys to play with during the time there will be a lot of noise or festivities will keep an active and distracted mind. For cat owners, try spritzing catnip spray on the new toy. For dog owners, stuff a puzzle toy with peanut butter to keep their attention focus (we highly suggest peanut butter filled Kongs). It is ok to hug them, but do not reward any anxious behavior by fussing over them. Staying happy and in control lets them know everything is ok. If your doctor is already familiar with your pet’s issue, speak with your vet to consider anti-anxiety medication for your pet. Other options are diffusers (Adaptil for dogs, Feliway for cats) which release natural pheromones that help keep pets calm during times of stress.